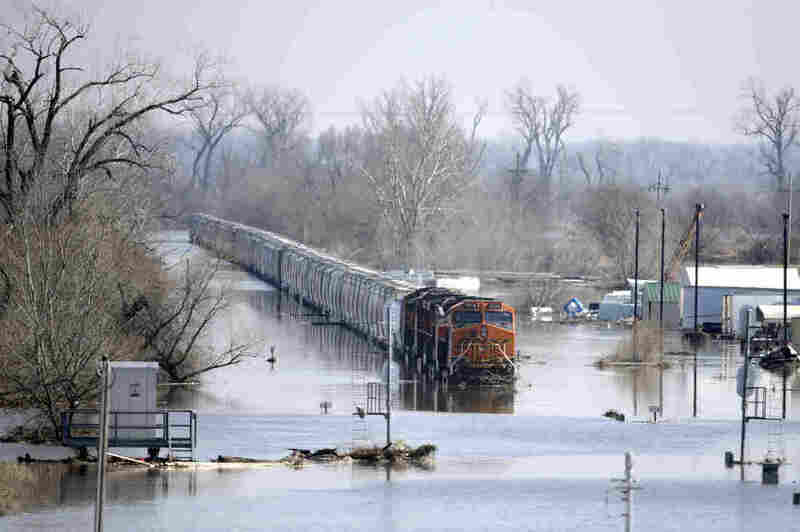 Midwest Flooding: 2 Dead As Waters Breach Levees Along Missouri River Spring floods are no surprise in communities along the Missouri River. "My washer and dryer are floating around down there somewhere," said one Iowa resident. In parts of the Midwest, floodwaters are starting to abate. But elsewhere, they're still rising. Hornick, Iowa, resident Dale Ronfeldt's basement is flooded with 4 feet of water, Iowa Public Radio reports. "My washer and dryer are floating around down there somewhere," Ronfeldt said. A flood warning is in effect through Tuesday morning for counties in southwestern Iowa and eastern Nebraska. In Missouri's Holt County, homes have taken on 6 or 7 feet of water. The flooding followed an intense winter storm known as a "bomb cyclone" of wind and rain late last week. Two deaths have been attributed to the flooding, and two men are missing, according to The Associated Press. Rising waters breached levees up and down the Missouri River, and the Army Corps of Engineers noted on Sunday that the threat continues: "the enormous volume of water ... is currently compromising the majority of the federal levee systems along the Missouri River from the confluence of the Platte River to Rulo, Nebraska." For communities along the Missouri River, spring floods are no surprise, but their frequency hasn't made them easier to manage. "Upstream and downstream the finger-pointing begins, at the Corps, at Congress, at environmentalist[s] and farmers, at each other," wrote columnist Tony Messenger of the St. Louis Post-Dispatch. "Part of the historic problem with seasonal flooding in the Missouri River Basin is that everybody acts in their own self interest, particularly when it comes to developing in the floodplain, taking away the land where the water wants to go. After floods, we build levees bigger, rather than tearing them down and giving the river room to flow." All that water has to go somewhere. 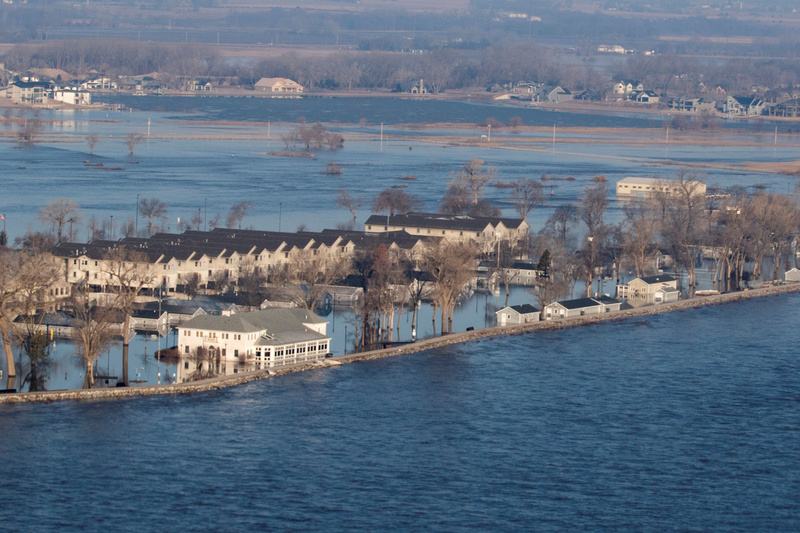 The town of Hamburg, Iowa, made it through a major flood in 2011 by piling extra dirt on top of a levee, The Daily Nonpareil reported: "Locals wanted to keep the higher levee, but federal officials said they would have to make about $5.5 million in improvements. That was too costly, so the levee was lowered to its pre-flood height." "The government made us tear the top off of the levee and bring it down to stump size," resident Lana Brandt told the newspaper. "And so the water's rushing over the levee now. Whereas, if we had been able to keep that levee, we might have been able to keep our community dry, and we wouldn't lose businesses and property and crops. This is huge." Residual flooding was expected to continue on Monday, the National Weather Service warned. "[R]ivers and streams continue to be at record levels and have expanded to areas unaccustomed to flooding. Travel is still hazardous, and is discouraged. Please do not drive across flooded roadways." In Nebraska, the floodwaters inundated two military facilities, Offutt Air Force Base and the Nebraska National Guard's Camp Ashland. But the apparatus apparently didn't work so well against this flood: The water was reportedly 5 feet high inside one of the site's buildings. "It appears [the floodgates] were not very effective, because the sheer amount of water was much greater," Spc. Lisa Crawford, a spokeswoman for the Nebraska National Guard, told the newspaper. "This is the first time they've really been tested."